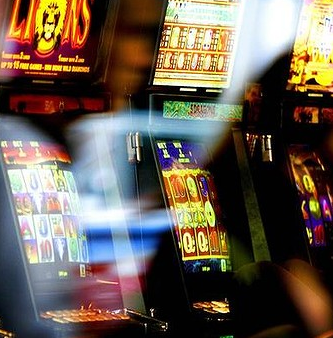 Pokies [that’s ocker Aussie slang for gaming machines – Ed] have swallowed a chunk of the federal government’s carbon tax compensation, new figures suggest. Revealed today by The Australian Financial Review, the figures show handouts to low-income earners under the scheme have led to surges in gaming revenues from pubs and clubs in Queensland and Victoria. They show that there was a 7 per cent rise in poker machine revenues in Queensland in May when the government’s first clean energy payment was made to eligible people. Just another unintended consequence of old fashioned socialist interventionism. In May and June ? I don’t think so. The Green Independent Wilkie voted for this!!!!! No problems – those of us still with jobs will just pay more tax to offset this. But Simon, you missed the point. Because they were all down at the pub playing the pokies there was no one at home using electricity therefore, spending (wasting) someone else’s money all the while saving your own is good CentreLink to home to pub economics. It’s the gold standard way to cut emissions, pay everyone to be down at the pub, and not at home, and in the end it will only be necessary to have enough electricity to run a pub. This was the plan all along; you can beat AGW by dousing it in beer and pouring the excess into the pokies. Any climate scientist could have told you that, but….. no…….you wanted to be a skeptic…….well serves you right. Unintended consequences are like that.. unintended.. The Health Minister says that the results from Queensland are just one state and do not matter! She says we all received a benefit! Did we???? If their bills are being paid then this is not a problem, because they are only spending their own money as long as the bills are paid first. The $380 bribe to pensioners is all but gone, playing the pokies and other goodies (nothing left for increases in insurance, electricity and other conmodities) Insurance already gone up by $360 pa. Sounds to me like cokie pokie. Labor doing what they do best … screwing things up. Tragic indeed – not for the losers who put their money into those annoying beeping machines, but for the children who, by no choice of their own, have such losers as parents. Whoever first said that gambling is a voluntary tax on the mathematically idiotic got it right. About 9 years ago I invented the rather PiC term “loser lounge” for those foul places. Reports like this show why there has to be incentives to be productive in our economy. PM Milne-Gillard deals only in disincentives. Disincentives to even get out of bed in the morning.